The Family Panel love nothing more than a good bowl of home made curry, but rice is often a sticking point. Gadget Dad can't cook rice, and 20SomethingMum can't cook, well, at all. So what did they think of Veetee's Microwaveable rice? I love rice, simple, and often when I am watching what I eat I replace chips or pasta with rice, and find I shift the pounds easily. But rice can be a pain to get tasting right, either it gets undercooked and stays hard enough to choke you and your fellow diners, or overcooked and than tastes stodgy, and either way is unappetising. I had seen Microwaveable rice in bags and packs on its own, but was skeptical as to how it would taste- I remember the days before children of Micro Curries where the curry itself was delicious but the rice was awful and hard. 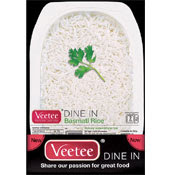 We tried Veetee Plain Basmati Rice. Its listed as taking 2 minutes in a 800 watt microwave, mine being a 750 watt meant it took about a minute longer. It is simple, and I think students will love it, as it requires no cooking skills what so ever, and no extra containers to wash up! It did, as suggested need fluffing with a fork afterwards, but it came out hot, and fluffy, like properly cooked rice should, and tasted lovely, neither rock hard or stodgy, just tasty fluffy rice, and the portion size easily serves two. We also tried the Mushroom variety. Again, ridiculously simple to cook and looked like rice should. It was a little bland though, there were lots of bits of mushroom in the rice, and it was satisfyingly coloured, but unless you had a spoonful with a bit of mushroom on it just didn't really taste of Mushroom, so for those looking for a subtle yet different accompaniment to a meal then this would be quick and ideal as it wouldn't overpower the main dish. Again it easily served two. Priced at 1.44 per pack, and widely available from supermarkets, these are a good item to have in the kitchen if you fancy a quick meal after a busy day, with no mess or fuss, they serve two people and don't cost a lot considering the time and effort, not to mention thrown away attempts at trying to get the rice right. I love these and always have some stashed in my cupboard as they're pracically always on offer in Asda when I go for £1 each which is a bit of a bargain and cheaper than other brands too. I would say they serve two but it's usually me and my 8 year old so I probably have more than I should! Tatses just like rice from a curry house - yum!